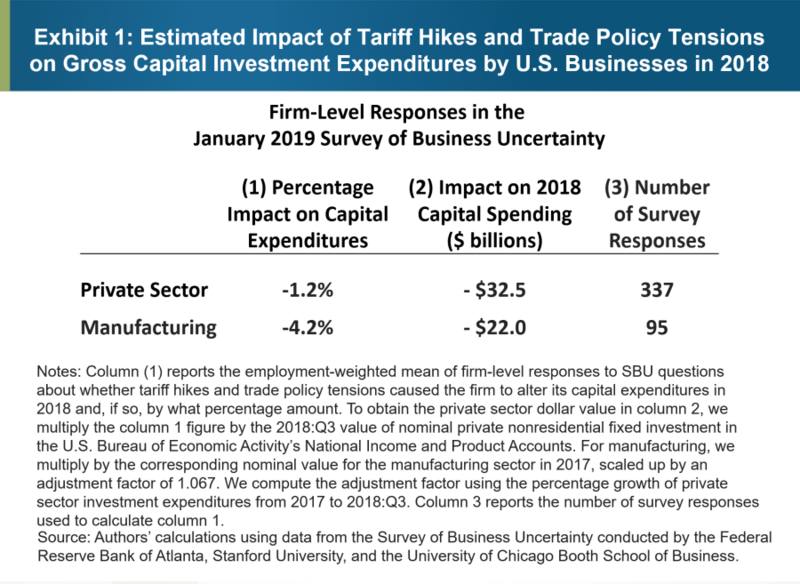 We estimate that tariff hikes and trade policy tensions lowered gross investment in 2018 by 1.2 percent in the U.S. private sector and by 4.2 percent in the manufacturing sector. This estimate takes on heightened impact given today’s employment release indicating manufacturing employment was essentially flat. 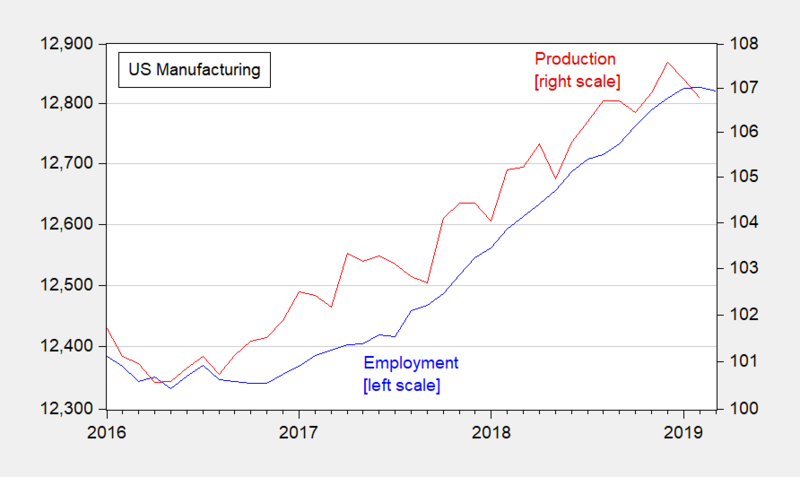 Figure 1: US Manufacturing employment, 000’s (blue, left log scale), and manufacturing production (red, right log scale), both seasonally adjusted. Source: BLS and Federal Reserve via FRED. These are the devil people, be careful. There was another book some dirty liberals and pro-education Satanists told me was a really great book about policy, and, in a moment of personal weakness, I may have even purchased the thing. You know, another one of those damned “Puh-hud” degree goofballs. I forgot has name. “Fly-by-night” policy guy. Damn!!! What was his name?!?!?!?!? Uncertainty is only bad if Paul Ryan says it is. He retired, so it’s OK now. Sheesh. Don’t you know anything? PLEASE spread the word wherever and whenever you can. Certainty (outside of business planning) can sometimes be a bad thing. Am I the only person, who thinks this says something, not at all flattering, about the intelligence of your “average” American?? Or am I being “Mr. Cynical” again?? Here’s what Katie Gorka has been up to at work. Katie Gorka, a Trump administration political appointee in the Department of Homeland Security, suggested in a July 2017 email that the agency, which had just canceled funding for a group dedicated to deradicalizing white supremacists, redirect its efforts to focus on the real threat: anti-fascists…Gorka couldn’t think of any specific groups, she wrote in response. But “it would also be important to get the data on the actual threats right now,” she added, “because my understanding is that the far-left groups (Antifa, or anti-fascist) are currently on the rise.” Her claim, which is not backed by any data, is the most obvious example of a trend that pervades a tranche of DHS emails obtained by HuffPost: Trump administration officials came into office with very specific — and mistaken — ideas about what violent extremism in the U.S. looked like, then went searching for evidence to back up those ideas. In the state where I live, I was shocked as hell to find out that we have both Democratic Socialists (often referred to as “DSA” on the internet) and a small band of Antifa. I am in one of the “reddest” states in America (which you can piece together if you read my comments). As you might guess, these “activities” are concentrated around University campuses (you know, where all the “degenerates” hang out). Whenever Antifa or “DSA” form local protests, usually around badly written laws or recent racist activities, such as whites using “blackface” on campus, and whites in campus fraternities and sororities using the N word loudly on campus and in social media posts, about 5 Antifa members will show up to defend the victims of racism. You can imagine how frightening that is, when about 5 people of Antifa show up to defend blacks, hispanics, and Native Americans. People of the likes of Sarah Palin have to hide out in their homes from Antifa, shaking like a leaf out of fear for their lives. The message is very clear—if you are black, you are not welcome at the University of Oklahoma, or anywhere in Norman Oklahoma. And the current President of the University of Oklahoma will do near nothing (aside from window dressing, if that even) to assure the safety of black students residing on campus or near the University campus. And you can make your “best guess” how the college town of Norman Oklahoma’s police feels about black students on Oklahoma University’s campus and assuring their safety. And make your “best guess” what campus police and town police in Norman do to fraternities of Oklahoma University who actively search out blacks and other minorities to victimize on campus or near the campus. If you guessed “nothing” you may get today’s game prize. If I was an African American parent, or an African American student—until the University of Oklahoma changes their current President and Norman Oklahoma police change their attitude to blacks being abused on campus—I would not have myself or a loved one attend Oklahoma University for fear of my children’s safety. As far as Antifa, who provide the safety to minorities that the Norman Police and others seemingly refuse to give them, the police don’t like people who offer safety (i.e. services) to the minorities who police are voluntarily negligent in protecting. are you sandwichman’s (preaching last week at angrybear) disciple? Since I don’t bother to read papers anymore, can you tell me how to separate the individual influence of actual tariff/trade policy from the enacted tariffs and changes in trade agreements? Bob Flood: No paper here… but in general it would be hard. I like to make little predictions on this website sometimes. Sometimes I get them right, sometimes I get them wrong. I was wrong that donald trump would actually enact his tariffs war with China and other countries. I thought it was a kabuki show for his political base, and he actually enacted the tariffs, so I was wrong. Got another predication clear out of left field here. Sometime in the next 3 years (OK, that is a BIG window, but she’s doing image repair right now) Megyn Kelly will be a guest on Joe Rogan’s podcast/Youtube channel. He has poked fun of her many times. Let’s see how Rogan starts to soften his stance on her, when he and she see a ratings bonanza in the makings.